Toyark sponsor HobbyLink Japan has sent us word on a new pre-order. 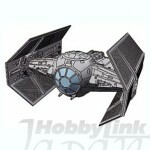 Fine Molds is releasing a plastic 1/72 Scale Star Wars Darth Vader Tie Fighter model kit. It is listed for a July release. The price is $20.39. Check out a photo by clicking the thumbnail.